Every year for the Epcot International Food & Wine Festival there are some very special “premium events” that you can attend for an extra charge. Everything from burger parties to mixology classes. This year even the Disney resorts will get in on the game with some fun happenings such as the “Behind the Scenes at Trader Sam’s Grog Grotto” event. *Four all-new interactive culinary adventures in the Disney resorts encourage guests to ask the experts, taste and cook alongside our chefs at Disney’s Grand Floridian Resort & Spa, Disney’s Contemporary Resort, Disney’s Polynesian Village Resort and Yachtsman Steakhouse at Disney Yacht Club Resort. *The new “Mix It, Make It Celebrate It” hands-on workshop gives guests the opportunity to learn from the pros – cake decorating, garnishing, cocktail mixing and other fun activities. *The always-popular Cheese Seminars return. Learn “the wheys of the world” paired with wine, beer and other beverages with Max McCalman along with other experts. *Rockin’ Burger Block Parties are back for just three Fridays at World ShowPlace – and each party features a celebrity chef and all-you-can-eat specialty sliders paired with beverages. Join Chef Maneet Chauhan on September 30, Chef Alex Seidel on October 14, and Chef Jehangir Mehta on November 11. *You’ll want to masquerade in chic yellow and black for the Yelloween Masquerade Party for the Senses October 28 and 29, an elegant, dance-the-night-away, gourmet tasting party with Champagne, wine, craft beers and specialty cocktails paired with food. 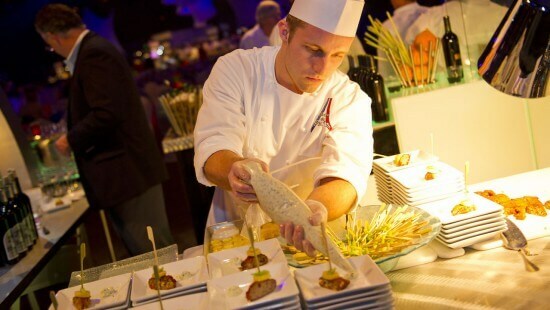 This year’s Party for the Senses will be every weekend in October (that’s it!). October 8 features all the new chefs from Disney Springs; October 15 is a reprise of last year’s popular evening with Disney chefs from around the world. *What’s Cookin’ With … some of the country’s top celebrity chefs will begin the morning with a delightful plated brunch and sparkling wine toast. The fun starts with a demo, and the chefs answer questions from the audience and share secrets of their successes. The brunch is on select Fridays and Sundays at 10 a.m.